If you prefer easy recipes with only a few ingredients—that also taste amazing—then this Black Cod marinated with Manuka Honey is perfect for you. Offering a great amount of protein, well matched spices, and all the benefits that come with Manuka honey, this dish can be made by the most amateur of cooks and provides the most bang for your buck. One of the other many perks of this black cod recipe is that you can reuse the honey marinade, as it keeps in the fridge for a few days after the first initial use. With a cook time of only about eight minutes and even less prep time, this meal serves at least six people, making it the perfect middle of the week dish for families or even just a group of friends. 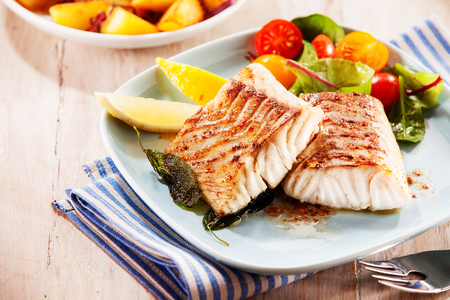 Well now, here’s how to make this black cod, marinated with Manuka honey, in just a few steps. Add the Manuka honey, soy sauce, grapeseed oil, and vinegar in a bowl. Give a stir and place the fish in the bowl. Cover top with a weight, such as a can, and then refrigerate for up to 24 hours. When you’re ready to start cooking, preheat the oven to 450°F. Remove the fish from the marinade and season it with salt and pepper. Put the fillets on a baking sheet and cook them in the oven until they have a golden/dark-brown hue. They should be cooked through for at least seven to eight minutes. When serving, put a fillet in the center of each of the six plates. Spoon some marinade over and around the fish, and enjoy your Manuka Honey-marinated Black Cod! If your New Year resolution is to eat healthier, this recipe is a great way to start. This low-calorie meal will satisfy your sweet tooth without ever leaving a feeling of guilt.